I love my life as a Food Blogger. Like a lot. I am given the opportunity to eat the best foods at the finest restaurants. I also love to experiment in the kitchen at home with recipes of my own. Because of this, it’s even more important that I have a excellent oral hygiene routine. 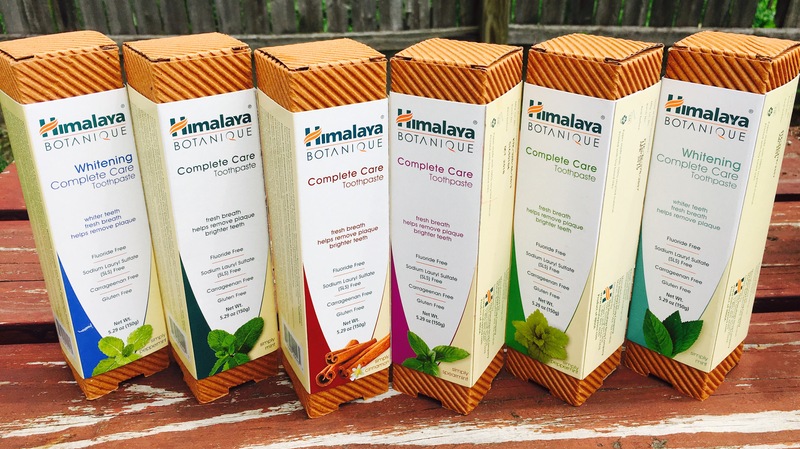 As a Moms Meet Blogger Ambassador, I was given the opportunity to review Himalaya Botanique Toothpaste. Since I wasn’t familiar with this particular product, I did a little research on them prior to receiving my package. Founded in 1930, the Himalaya legacy now spans over 85 years, stretching from one man, to his son, to his grandson. From our humble beginnings in India, our products are now offered in over 90 countries, yet we’re still family owned. -Great taste and long lasting flavor in all 7 different varieties. Full line of flavors: Whitening Complete Care Simply Peppermint, Whitening Complete Care Simply Mint, Complete Care Simply Peppermint, Simply Mint, Simply Cinnamon, Simply Spearmint and the Original Neem and Pomegranate toothpaste. -Free from harmful ingredients like, Carrageenan, Fluoride and SLS. -All 7 varieties are Gluten Free. -Foaming action leaves your mouth feeling fresh all day. -Himalaya offers a different approach to ingredients. Neem-Cleans teeth and gives this formulation it’s sparkle. Neem is history’a original housekeeper and works to keep the mouth clean. Pomegranate-An astringent fruit extract that helps support healthy looking gums. Triphala-A traditional detox formula in ancient Ayurveda composed of the three myrobalan fruits for clean teeth and a radiant smile. Xylitol from Birch Tree-Not only a tooth-friendly sweetener, but it has also been clinically-studied to support good oral hygiene. I am always on the look out for natural toothpaste, so I was very excited. In my special package was 6 varieties of toothpaste: simply peppermint (whitening complete care), simply mint (whitening complete care), simply cinnamon, simply peppermint, simply mint, and simply spearmint. I LOVED all of them!! They had a very nice flavor to them and after brushing my teeth they felt and looked very clean and sparkly. I definitely recommend Himalaya Botanique Toothpaste for your oral care regiment. My package also included a bamboo toothbrush (I always wanted one!!) and a super cute tote and cosmetic bag. I can’t wait to use them! Thanks Himalaya and Mom’s Meet for the goodies! *I received these product free for review purposes, as part on the Moms Meet Blogger Ambassador Program. All thoughts and opinions are my own.